The secret to this fabulously flavoursome curry is a homemade curry paste, combining fruity Chilli Pepper Pete’s New Mex Red chillies, sweet red peppers, coriander and cumin, which goes beautifully with rich lamb shoulder. Making your own curry paste might sound like unnecessary effort, but it really does make a huge difference to the finished dish. 1. First you’ll need to rehydrate the dried Chilli Pepper Pete’s New Mex Red chilli – chop it into a couple of pieces, place in a small bowl and cover with boiling water. Leave it to sit for 30 minutes, or until soft. By the way, I’ve used about a third of one chilli in this dish for a pleasant warmth & slight burn, but you could of course add more or less according to your taste. 2. When you’re ready to continue, finely dice the onion and get it frying gently in a scoop of melted butter, with the dried coriander leaf and fresh ginger. Once the onions are nicely softened, add the lamb and brown all over. 3. Meanwhile, roast the peppers for the curry paste. Place the peppers under the grill on a high heat, turning every now and then, until the skin is really blackened and papery all over. Remove from the oven and set aside to cool. 4. In a small blender (you could also use a jug and an immersion blender), measure out the tomato puree, dried coriander leaf and cumin for the curry paste, and add a pinch of salt, a splash of olive oil and the rehydrated Chilli Pepper Pete’s New Mex Red chilli. 5. Once the peppers are cool enough to handle, peel off the papery skin and discard along with the stalks and seeds, then add the peppers to the blender and pulse until you have a nice smooth curry paste. Transfer to the pan with the lamb and onions, and mix well, then leave to bubble gently for 30 minutes or so. 6. 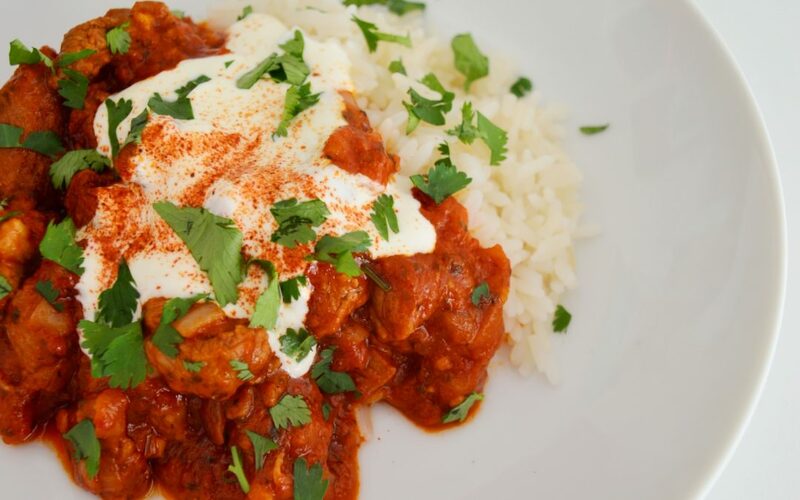 Cook the rice according to the instructions on the packet, then serve up with a generous spoonful of lamb rogan josh, topped with a dollop of sour cream, a little sprinkle of Chilli Pepper Pete’s Spanish Smoked Paprika and a handful of fresh coriander.